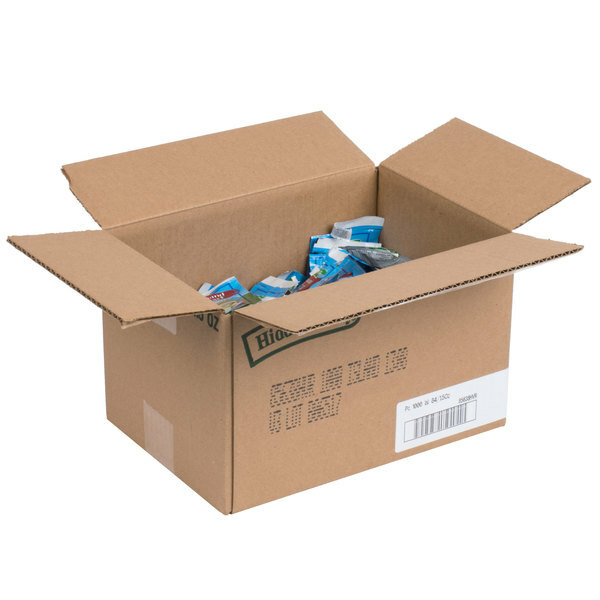 Stock up on these Hidden Valley 1.5 oz. thousand island dressing packets for your salad bar, restaurant, or catered event! The perfect blend of sweet and savory flavors, this dressing will deliver just the right amount of tangy taste to your customers' foods. With its mix of tomato, relish, oil, and spices, it adds a thick and creamy texture and zesty flavor to your sandwiches, subs, or salads. This classic dressing has a characteristic reddish-orange color. 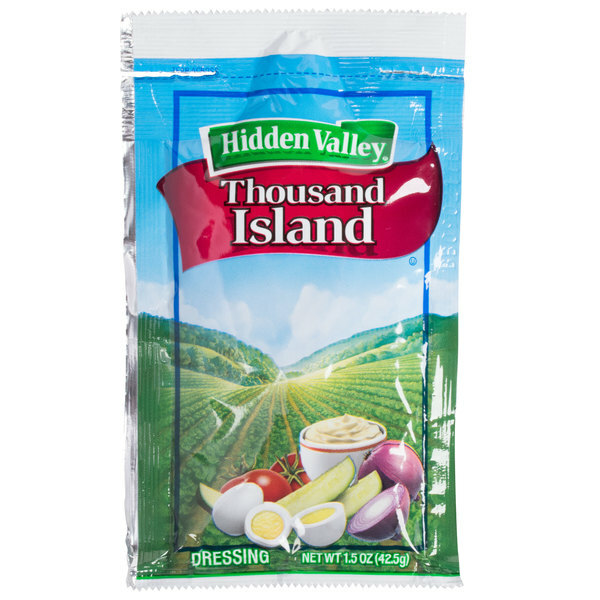 The tangy sweet test of Hidden Valley Thousand Island Dressing is perfect on any salad. It's also great as a side for fried vegetables and is a must for a proper reuben sandwiches. The portion control packets are perfect for in store, take out, or large gatherings. Sweet and creamy, Hidden Valley Thousand Island is as terrific on a sandwich as it is on a salad. The handy portion-control packet makes it perfect for single servings or for large gatherings. You can't go wrong with this one. Thousand Island is the perfect accompaniment for any salad. And, without thousand island dressing, you can't make a proper reuben sandwich. This handy portion-control packet is perfect for both. Great product in a perfect package. This is a very tasty and creamy dressing. The price of this on Webstaurant is more reasonable than on other sites or through my vendors. 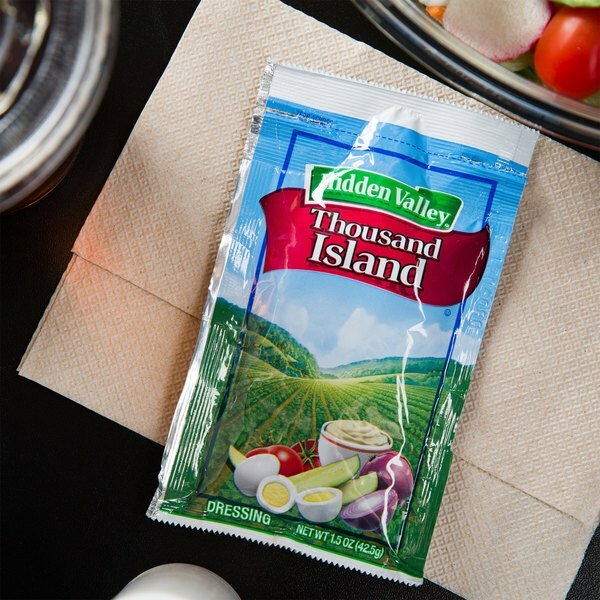 The Hidden Valley Thousand Island dressing packet is great and makes a great salad dressing for any type. The dressing is creamy and very tasty. I really like the Hidden Valley 1.5 oz. Thousand Island Dressing Packets because there is no need to measure out portions and its easier to keep track of the nutrition especially if you are tracking calories, fats or carbs. Its excellent on wraps and salads. I love Hidden Valley and their thousand island dressing is one of the most flavorful one I have tried. The dressing is great on my Ruben and the packet is just the right amount. Really nice thing about these Hidden Valley dressings is that they always are fresh ....vs having it in a gallon and taking up all that room in the walk in.